An ideal candidate is a vivid reader who keeps abreast on the advancement of science, engineering and technology and has strong appreciation of social, economic, and geo-political issues that influence regional science and technology developments. A team player, dynamic, inquisitive, meticulous, able to work under tight deadline and multiple projects, organised and structured working style, independent, resourceful, self-motivated and entrepreneurial and has positive attitude. Excellent communication and writing skills in English and Bahasa Malaysia. Ability to write reports, narratives, correspondences and minutes of meeting. Excellent skills in using Ms Word, Excel and Powerpoint and good skills in using other applications and software (adobe, search engines, application software). Excellent comprehension and ability to understand, a well-balanced emotional intelligence, critical thinking and analytical skills. Candidate with Hons Degree/ Masters in Science or Engineering field or Science Policy may apply. Candidate with experience in applied mathematics, data mining, statistical analysis and modelling, and databases are encouraged to apply. Candidate with experience in designing content of a programme and implementation of programme is also encouraged to apply. At least 3 year(s) of work experience is required for this position. Excellent working skill with Microsoft Excel, Word and PowerPoint. 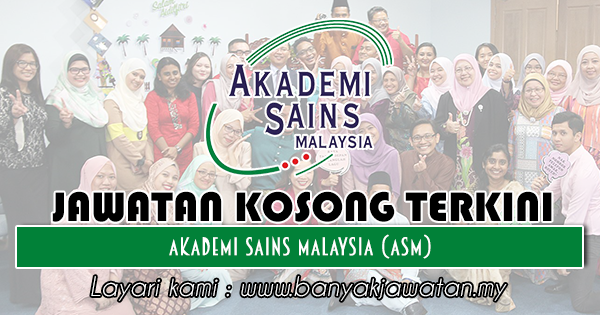 0 Response to "Jawatan Kosong di Akademi Sains Malaysia (ASM) - 30 September 2018"